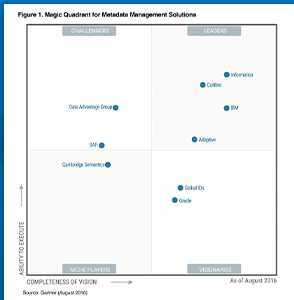 The 2016 Gartner Magic Quadrant for Metadata Management highlights the differing approaches of older, more IT-centric metadata management vendors, and newer business oriented solution providers. Metadata has historically been a technical discipline – delivered by metadata specialists or information architects, and the available tools have historically targeted this audience. The challenge – these technologies have been difficult to set up and maintain – meaning that business stakeholders and subject matter experts do not engage and their knowledge is not shared. The 2016 research shows some of the older vendors, such as ASG Rochade, have been quietly exiting this market. The focus on governance and accountability – knowledge is captured, communicated and approved by the correct people. The ability to integrate, assess and understand metadata from a variety of sources, including other metadata players, but also from multiple ETL tools, data quality tools, data modelling tools and more. ← How do we know if business is taking ownership of data quality?